Seagulls follow in the wake of the Staten Island Ferry. Hello friends, its been a while. I’ve been on a bit of a hiatus from poking around abandoned buildings, but I’m back now with something a little different. This is the first installment of a series on Staten Island—an area of the city that tends to go unnoticed, but is very much worth exploring. For the unfamiliar, Staten Island stands with Manhattan, Brooklyn, the Bronx, and Queens as one of the five boroughs that make up the city of New York. It is the third largest and least populated of the five. Its identity has always been somewhat distinct from the city at large, due in part to its geographical isolation. Prior to the construction of the Verrazano Bridge in 1964, no crossing existed between Staten Island and any other borough. It remains something of an outlier today, with a suburban nature and right-leaning political tilt. A record of neglect from city government has earned it the oft-repeated title “the forgotten borough,” and the name has stuck. The Staten Island Ferry departs from Lower Manhattan. From a Manhattan-centric point of view, a trip to Staten Island begins with a ride on the Staten Island Ferry. Over 21 million passengers embark on the 25-minute journey from Lower Manhattan to St. George each year. With dramatic views of the Statue of Liberty and the surrounding harbor, it’s a well-known attraction for New York City tourists. The ride is offered free of charge by the city’s Department of Transportation, but that hasn’t always been the case. An engraving of the 1871 “Westfield” disaster. Back in the 18th century, sailboats manned by private individuals competed for fares between Manhattan and Staten Island. In 1817, the first mechanically powered ferry service went into operation, under the direction of Captain John de Forest of the Richmond Turnpike Company. His brother-in-law Cornelius Vanderbilt took over in 1838. Existing ferry service proved inadequate as Staten Island developed, and accidents were common. In 1871, a boiler explosion on one of the ferries claimed the lives of more than 85 passengers. Jacob Vanderbilt, the president of the Staten Island Railway at the time, was charged with murder, but never convicted. In 1901, a ferry operated by the Staten Island Rapid Transit Company collided with a Jersey Central ferry and sank into the harbor soon after departing the port at Whitehall. Though the disaster was far less deadly than the 1871 episode, city authorities used it as justification to seize control of the service by 1905. The iconic orange color of the ferries was adopted in 1926, to increase their visibility in heavy fog and snow. A nickel fare was the rule through most of the 20th century, but was increased in 1975 to a quarter, and in 1990 to 50 cents, causing an uproar among borough residents. Coupled with mounting grievances over the Fresh Kills Landfill on the island’s west shore, the fare hike gave rise to a secession movement, which culminated in the passage of a non-binding referendum to make Staten Island an independent city in 1993. Efforts to secede were subdued by the election of Mayor Rudy Guiliani, who rode to power due in part to overwhelming support from Staten Island voters, many of whom had been won over by his promises to close the landfill and do away with the fare. He followed through on both, abolishing the fare in 1997 and closing the landfill in 2001. The Verrazano Bridge was the longest suspension bridge in the world at the time it was built. While the ferry has played a significant role in the history of Staten Island, the construction of the Verrazano-Narrows Bridge has arguably had the greatest impact on its development. The story of Staten Island can generally be understood in terms of two epochs—before and after November 21, 1964, the day the bridge first opened to traffic. Long-time residents speak longingly of Staten Island before the bridge—when country roads meandered through sweeping forests, quiet beach communities, and open expanses of farmland crawling with nanny goats. In the 19th century, full-time islanders lived side by side with some of the city’s wealthiest residents. As the industrialized city minted new millionaires, many of them looked to the rolling green hills of Staten Island as a scenic escape. The nature of the borough was permanently altered as the Verrazano-Narrows Bridge prompted a mass migration of newcomers from overpopulated Brooklyn. The influx covered farms and forests with mile upon mile of tract housing, plaguing the island with traffic problems that persist to this day. The official name of the Verrazano-Narrows Bridge includes a misspelling of its namesake, Florentine explorer Giovanni da Verrazzano. As much as the borough has transformed over the years, it has retained its essential otherness. Crossing the harbor by ferry or bridge signals a psychological detachment from the urban environment of New York as we know it. In the hum of traffic, or the roar of surf, the city melts away and you enter a new frontier. Beyond and in-between the strip malls and cookie-cutter houses, scattered remnants of an older, more pastoral Staten Island await. There, Times Square feels a million miles away. View of Staten Island obscured by fog, from Bay Ridge, Brooklyn. An early morning at Fort Wadsworth, on the opposite side of the span. The chairs in this patient room were undoubtedly arranged by a previous visitor to the abandoned hospital. It seems that everyone in Cedar Grove, New Jersey has a spooky story or two about the Overbrook Asylum. Though it only closed down officially in 2007, the complex has long been home to abandoned buildings, and local lore has been quick to populate them with unexplained voices, vengeful spirits, and mysterious presences. Situated among public parks and residential neighborhoods, the decaying asylum known by many as “the Bin” has become a well-known hangout for teenagers, ghost hunters, scrappers, and other curious parties, much to the consternation of local law enforcement. In 2008, the local sheriff amped up police presence on the property, leading to 34 arrests over the course of 3 days, though it was rented out as a location for the tacky Travel Channel series “Ghost Adventures” the same year. Rumors of 24/7 surveillance still serve to ward off would-be trespassers, but on the gloomy Sunday morning I set out to explore the aging asylum, not a soul, living or dead, patrolled the 100-acre grounds of the old Essex County Hospital. A clock stopped in an employee kitchen. I won’t rehash the history here that most every American asylum shares. (For a more detailed account, read up on psychiatric treatments at Kings Park Psychiatric Center and the “farm colony” design of Letchworth Village.) Suffice it to say that the good intentions Overbrook was founded on in 1896 couldn’t hold up to the harsh realities of overcrowding and underfunding that characterized mid-20th century institutions. This dark period of neglect ended, for the most part, with the development of new “wonder drugs” for the treatment of serious mental disorders, which led to the abrupt closure of asylums across the country. Though there’s little to differentiate the history of Overbrook Asylum from the dozens of similar institutions across the northeast, one particularly notorious episode stands out. On Dec 1st, 1917, the hospital’s heating and lighting plant broke down, sending temperatures plummeting inside the dormitories. As a cold snap hit New Jersey in the following weeks, 24 patients died as a result of or in conjunction with exposure, along with 32 cases of frostbite. In an act of desperation, the medical superintendent sent out letters to patient’s families in the hope that many would come to retrieve their relatives, who he admitted were living in “far from comfortable” conditions. One narrow cell was overtaken by moss and mold. The decrepit hospital closed down in 2007 when a new state of the art facility opened up nearby, which still operates today. By that time much of the property had already been long abandoned, with a dwindling patient population due in large part to the effective treatments developed in the 60s and 70s, as well as the pressure to discharge anyone who wasn’t a threat to themselves or others, no matter how unprepared they were to get by on their own in the outside world. Contrary to a few adamant commenters in online forums, most of the Overbrook campus is still standing on the east side of Fairview Avenue. A development plan to demolish the complex soon after it closed in 2007 would have brought 78 luxury single family homes to the area, but it never panned out. Today, the property is county-owned. Though plans were put in place to convert the land to a public park in 2008, little progress has been made in that regard. As Overbrook continues to crumble, the treatment of the mentally ill has been making headlines in recent months, and it’s troubling to see the same familiar patterns play out in an even more brutal setting—the prisons cells and solitary confinement units where many of today’s mentally ill end up. A recent article in the New York Times outlines a harrowing study of an epidemic of violence toward mentally ill inmates at Rikers Island which rivals the worst cases of abuse in the age of institutions. Earlier this week, a positive step was made on the West Coast, where the California Department of Corrections has introduced new standards for the treatment of the mentally ill living in the prison system. Here’s hoping this results in legitimate changes that can be instituted across the country. Tangerine curtains cast an orange glow on a staff washroom. Can anyone name this species? A drawer of sanitary bandages and thermometer sheaths seemed an unlikely home for them. A long, narrow corridor connects the administration building with living areas. A big screen TV left behind in an activity room. The table held paints, pipe cleaners, and other detritus from a day of arts and crafts. Some of the large, open day rooms were likely converted to dormitories during the asylum’s years of overcrowding. Many of the shoddily constructed partitions are toppling today. A hand painted mural decorates a day room, above a fireplace that was used to fight the cold during a disastrous heating failure in 1917. Several keys on this common room piano still functioned, though they had long gone out of tune. The cafeteria is one of the most impressive spaces in the complex. Cheap ceiling panels have fared badly with exposure to the elements. Bulletin boards in what appeared to be a staff break room. Old school surveillance displays, telephones, and a visitor log behind the front reception desk. An eerie display in an administration building bathroom, which had only been abandoned in 2007. An office area vacated 7 years ago with all the furniture left behind. In the dormitories, many of the rooms were locked from the outside and tantalizingly undisturbed. One narrow cell was far more decayed than the rest of the hospital, covered with moss and mold. The chairs in this room were undoubtedly arranged by a previous visitor. Last month Vocativ.com followed me through three decaying institutions in New York City, resulting in a three part series, “A History Abandoned” which you can check out on YouTube. If you’ve ever wondered what it’s like to venture inside an abandoned building, these videos give you a pretty good idea. Props to Vocativ for keeping the focus on the history. Let me know what you think and if you’d like to see more like this in the future! Head over to the brand new AbandonedNYC Print Shop to pick up some high quality prints of Letchworth, Kings Park, the Farm Colony, and other NYC hospitals, factories, and military sites. Only in New England is the essence of autumn so vividly arrayed, no more so than the Berkshires of western Massachusetts. The pastoral region was revered among literary luminaries of the 19th century—it’s rumored that Melville first envisioned his white whale in the wintry outline of Mount Greylock—but it’s also a wellspring of inspiration for local storytellers. 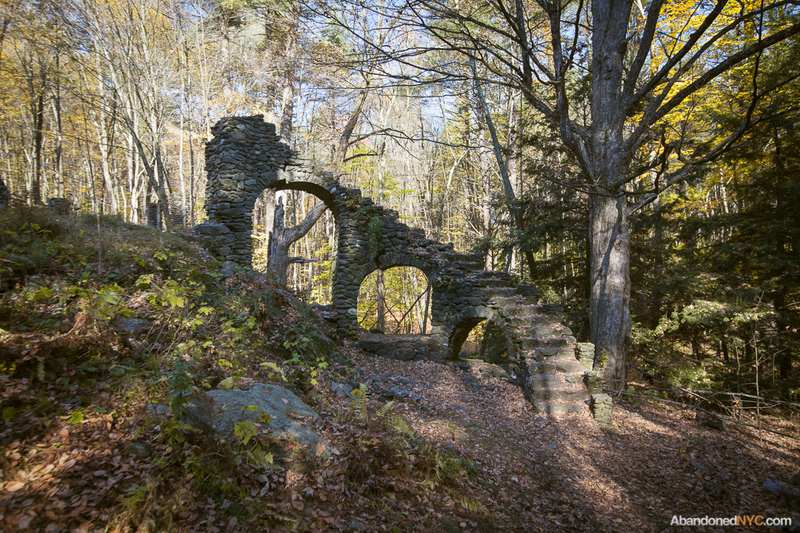 The Berkshire hills are laced with legends and more than their fair share of ghost stories, so I got out of town to explore this mysterious region and hopefully encounter a few ghosts, just in time for Halloween. The Old Coot is usually sighted in January; so I settled for this reenactment. My first stop was the Bellows Pipe Trail on Mount Greylock, known to be haunted by a ghost called the “Old Coot.” This unfortunate soul went by the name of William Saunders in life and earned his living as a farmer before being called away to fight for the Union in 1861. His wife Belle assumed the worst when the letters stopped coming after receiving word that her husband had been injured in battle. But Bill Saunders had survived, only to return home and find Belle remarried. He retreated to a ramshackle cabin on Mount Greylock, where he lived out the rest of his days as a hermit, occasionally working on nearby farms. One day, a group of hunters entered his shack and came across his lifeless body. They were the first to describe a sighting of the Old Coot’s spirit fleeing up the mountain, but he’s haunted the trail ever since. On the outskirts of Brattleboro, rumors about one eccentric local are still raising eyebrows more than fifty years after her death. Madame Sherri was a well-known costume designer in jazz-age New York City whose designs were featured in some of the most successful theatrical productions of the day. After her husband died of “general paralysis due to insanity,” Madame Sherri retreated to an elaborate summer home in the Berkshires, where she was known to throw lavish and unsavory parties for her well-heeled guests, often gallivanting about town in nothing but a fur coat. Gradually, her fortune was depleted and the dwelling was abandoned in 1946. Late in life, she became a ward of the state and died penniless in a home for the aged. Her “castle” burned to the ground on October 18, 1962, but its dramatic granite staircase remains to this day. Sounds of revelry have been heard emanating from the ruins of the old estate, where the apparition of an extravagantly dressed woman has often been spotted ascending the staircase. Parked at the base of Mount Greylock. The town of North Adams appears from a hillside en route from Mt. Greylock. In 1819, a route was proposed to transfer goods from Boston to the west, and the Hoosac Range was quickly identified as the project’s biggest obstacle. Construction began in 1855 on the 5-mile Hoosac Tunnel, but the dig was plagued with problems from the beginning. When steam-driven boring machines, hand drills, and gunpowder proved too slow, builders turned to new, untried methods, namely nitroglycerine, an extremely powerful and unstable explosive. The tunnel claimed close to 200 human lives over the course of its 20-year construction, earning the nickname “The Bloody Pit.” The work was merciless, but precise—when the two ends met in the middle, the alignment was off by only one half inch. An abandoned pumphouse sits beside a waterfall in the woods near the railroad tracks. On March 20, 1865, Ned Brinkman and Kelly Nash were buried alive when a foreman named Ringo Kelly accidentally set off a blast of dynamite. Fearing retaliation, Ringo disappeared, but one year later, he was found strangled at the site of the accident, two miles into the tunnel. No one witnessed the crime, but most men agreed—the ghosts of Ned and Kelly had slaked their revenge. The entrance to the Hoosac Tunnel opens up from around a bend in the tracks. The most costly accident in the tunnel’s history occurred the following year on October 17th, halfway through the digging of a 1,000-foot vertical aperture called the Central Shaft which was designed to relieve the buildup of exhaust in the tunnel. Thirteen men were working 538 feet deep when a naphtha lamp ignited the hoist building above them, sending flaming debris and sharpened drill bits raining down. The explosion destroyed the shaft’s pumping system and the pit soon started filling up with water. When workers recovered the bodies several months later, they discovered that several of the men had survived long enough to construct a raft in a desperate attempt to escape the rising waters. The accident halted construction for the better part of a year. When work resumed, laborers reported hearing a man’s voice cry out in agony, and many walked off the job, claiming the tunnel was cursed. Through the 19th century, local newspapers reported headless blue apparitions, ghostly workmen that left no footprints in the snow, and disappearing hunters in and around the Bloody Pit. As recently as 1974, a man who set out to walk the length of the tunnel was never heard from again. Staring down the black maw of the Hoosac Tunnel. Sure enough, the moment I stepped across the threshold, my camera started taking pictures by itself. (Granted, it’s been having issues lately, but the timing and severity was uncanny.) The whole time I was in the tunnel, I was unable to gain control of the shutter, and had to resort to setting up a shot and waiting for the “unseen forces” to take each picture. It beats me why a ghost would choose to fiddle with my camera rather than, say, making the walls bleed, but the entire encounter left this skeptic scratching his head. Were these the spirits of the Hoosac Tunnel? Back at the campsite, with the fire extinguished, I settled in for a fitful sleep on the hard ground, unable to shake that uneasy feeling. That night, the falling leaves outside the tent sounded just like footsteps. When the wind blew, the whole forest sounded like a crowd of ghosts walking. It was exactly the kind of night I had hoped to pass in the Berkshire hills, a chance to experience the other side of the season, beyond the spiced cider and the pumpkin lattes, far older than the covered bridges that cross the languid Hoosic River, that ancient date that marks the beginning of the dark half of the year, when the boundary between the living and the dead is at its thinnest point. As far as I dared to go in the haunted Hoosac Tunnel. A bit of Halloween spirit displayed outside the Bellows Pipe Trail.